Me, Raj Sharma, Vir Das, Tehran Von Ghasri and Jeremy Craven at the Ishanya Amphitheatre in Pune, India, Jan. 23, 2015. 1. Why did you go to INDIA?! I visited for the Weirdass Pajama Comedy Festival, presented by popular Bollywood actor and comedian, Vir Das. My friend, American comedian Raj Sharma, referred me to the festival. Raj, myself and fellow Americans Jeremy Crave, Tehran Von Ghasri went from Hollywood to Bollywood, to perform on the “American Invasion” show. 2. Do they speak English? Yes! Last time I checked, India used to be owned by the British, who totally speak American. It’s also one of the most tech-savvy nations in the world, so they have mad wifi reception, which imports most references on American pop culture. You can’t escape America, even in India. 3. What did you eat? When I announced I was going to India, people made it seem like I’d be spewing liquids from every hole, shitting myself all the way back to the States. As a result, I stuck mostly to the energy bars I packed for the first few days. Then, our first “meal” was at McDonalds, a restaurant I hadn’t entered in 15 years other than to put something healthy inside by using the bathroom. I reluctantly ordered french fries and my mouth felt all tingly afterwards. I was determined to at least try some of the local cuisine, but I didn’t know what was “safe” according to American warnings. Luckily, I met a new friend named Rebecca Vaz who convinced me to trust my gut. Through her guidance, I let go of the fear of complete digestive destruction and experienced some great Indian food. Dal, curry, naan, biriyani—delicious! I learned the places you can trust to eat from are pretty much the same in the U.S. I wouldn’t eat street food in India, but I also wouldn’t eat one of those bacon-wrapped hot dogs off Hollywood Blvd. I finally realized most of the tourist warnings are for people who can’t handle the spiciness. Since I grew up eating Mexican food, I was good. Me with my Mumbai dietary consultant, Rebecca Vaz, wearing my Free Hugs shirt! I even had a coconut from a local vendor, every travel blog’s worst nightmare. 4. Isn’t it dirty there? It was after I got done shitting my guts out! No, but actually, yes—It’s one of the dirtiest cities I’ve seen. The smell of burning trash and smog hits you as soon as you land. But even with the dirt, the beauty of Mumbai shines through the history, culture, character, food and friendly people. And the locals are doing something about the pollution. The newly launched “Clean My Mumbai” campaign is off to a great start… Next time, I look forward to running a 10K and eating saag off the pristine streets. 5. What was comedy like in India? You may not think of India as a hot spot for comedy, but if the kind of dedication, organization and audience enthusiasm I saw was any indication, your mind may soon change. 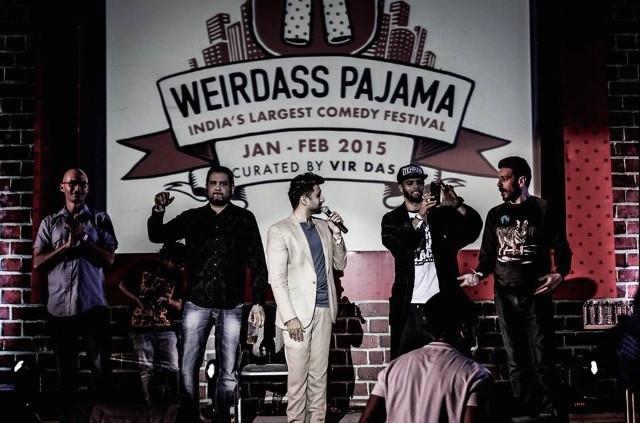 The Weirdass Pajama Festival was curated by top Indian comedian and actor, Vir Das. Vir Das jams with his band at Copa in Juhu Beach. I didn’t expect much from a comedy scene that has only been around for about six years, so I was surprised to learn Vir and his WeirdAss Comedy crew put on 120 shows in Mumbai, Pune and Delhi over two weeks. Damn! I’ve been to festivals that have a hard time getting performers to one show, let alone 120. 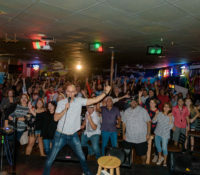 I did six shows in total, and most of them were packed to capacity. Vir’s team pulled it off without a hitch, masterfully coordinating hotels, meals, crew and transportation. This is a two-year old event that felt like a seasoned, world-class festival. 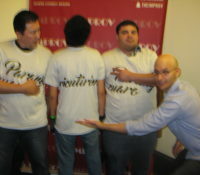 With WeirdAss Pajama Festival staff. What a bunch of over-achievers! That’s probably the biggest difference between Indian and American comedians. American comics are often characterized as slackers who “get up at the crack of noon.” Many get into stand up to avoid a day job. But the Indian comics I met seemed like the best and brightest in the country. 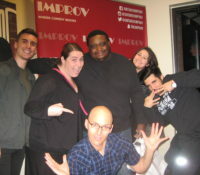 They were an educated bunch, with many comedians holding engineering or doctorate degrees. What’s harder? Getting laughs for 10 minutes or completing a phD dissertation? I was blown away. How could a country like India create a such a vibrant comedy scene that could compare to most major US cities? I remembered about 10 years ago when an Indian-Canadian named Russell Peters played sold out shows across the country after his clips went viral. Since then, a few inspired Indians have put in many hours of hard work to earn their stripes on the mic. You don’t have to look further than Vir, who can pretty much do anything: stand-up, acting, music, even organizing a comedy festival! The other difference between Indian and American comics is that the comedy community there was super supportive—quite refreshing compared to my hyper-competitive hometown of Los Angeles. They gave each other tag lines, watched each others’ sets intently and even gave me cultural references that made a huge difference in my performances. 6. What was your favorite part? I have to say the relationships I have started are the most valuable thing I got from the trip. So, here are few of my new friends, as well as some random pics from the trip. Make sure to click the performer links and become their fans, as I am. Jeremy Craven, Rebecca Vaz and me at a famous, important Mumbai church I can’t remember the name of. Me and the guys from Glow Worm Pictures. Feeling adorbs next to Sumukhi Suresh. Sharul Channa and me trying to be like her. Jeremy Craven after I told them he was Bradley Cooper. This guy reminded me of my favorite ice cream sandwich. I probably reminded him of his favorite sausage link. See you again soon. MMMMbai!